Mobile Ramps and Lifts stair lifts are designed for homeowner installation. It normally takes 2-4 hours for the installation. If desired, you may contract with us to install the stair lift for $575 in most cases. Installations on concrete, tile, or steel stair cases are a little more. What kind of warranty do Mobile Ramps and Lifts stair lifts come with? The Mobile Ramps and Lifts AC comes with 5 year parts warranty and a 10 year warranty on the drive train. We are so confident of the quality of this stair lift that we provide the best warranty in the industry. The DC features the same warranty except for the battery which is covered for one year of normal use. 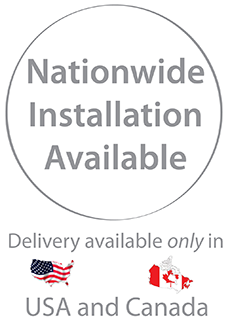 Warranties for our heavy duty, reconditioned, and used stair lifts are listed on their respective product pages. We have several different stair lift options. Our most popular and most streamlined is our Apex Stair Lift. The track on our Apex Stair Lift only takes up 11.5 inches of your staircase when folded up. When the stair lift is in use only 14 inches of space. We have other units that take up slightly more space; our HD units seats do not fold. If your staircase is less than 36 inches wide, it is recommended that you sit the user in a chair that is up against a wall, and measure the distance from the wall to the user's knees. Once this information is forwarded to us we can assist you with determining if you have enough room to use your stair lift. Find out how to measure for stair lifts. Most Mobile Ramps and Lifts stair lifts have a lifting capacity of 350 lbs. The Mobile Ramps and Lifts Heavy Duty Stair Lift has a 500 lb. weight capacity. Each stair lift is designed for use by one person at a time. The Mobile Ramps and Lifts stair lift needs very little maintenance - just a light greasing of the track every 6 months will keep it running smoothly. Are Mobile Ramps and Lifts stair lifts safe? Mobile Ramps and Lifts stair lifts comply with standards and codes established by the American Society of Mechanical Engineers (ASME), Intertek (ETL), and the Underwriters Laboratories (UL).